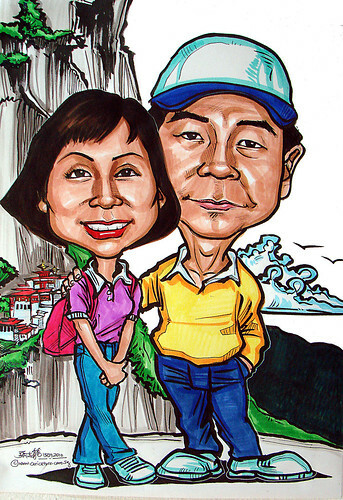 I will need to order for a wedding anniversary caricature. It will be for my god mum 38th wedding anniversay. I will like to have it done by the 16 Sep 10 if it's possible. I will like it to be frame and size be looking at will be A3 as it will be display at the reception area. Attach is their recent photos taken in Bhutan. Please let me know if you need more. - I hope to have the background using SAM_0056(in the attach). - Godmum to be wearing purple colour (as that's her favourite)"